The markets were pulled back and forth on political uncertainty this week. First, Italy sparked euro breakup fears again as a new coalition government looked like it might fail. Then the U.S. administration upped the ‘trade war’ rhetoric. 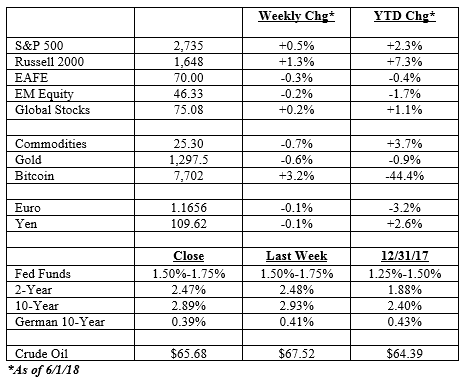 Despite the political uncertainty, equities in the U.S. managed to gain ground, with the S&P 500 adding +0.5% while small-cap U.S. stocks advanced +1.3% and the NASDAQ +1.6%. The overseas markets were weaker with the developed EAFE index losing -0.3% and emerging markets dipping -0.2%. Where political uncertainty had its biggest impact was on bond yields. 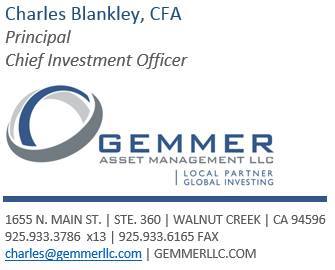 The 10-year fell to 2.89% from 2.93% last week, and is well off the highs of 3.11% set back on May 17th. Long-term government bonds jumped +0.6% this week. High-yield was off -0.4%. The main economic report of the week was Friday’s payrolls report. It showed that the U.S. economy posted its lowest unemployment rate in 18 years after employers added 223,000 jobs in May. As a result, the unemployment rate fell to 3.8% – its lowest level since April 2000, as you can see below. 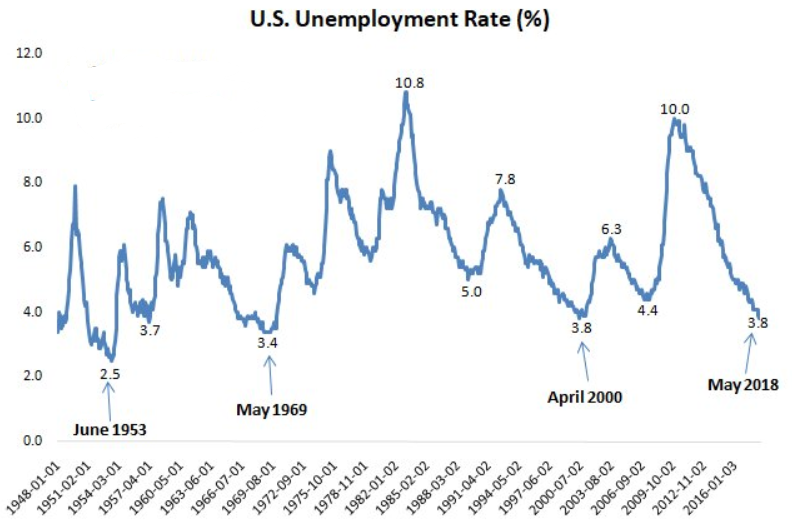 Looking at the chart above you can see that unemployment rates below 4% are relatively unusual. At the current pace we may challenge the May 1969 low by early next year. 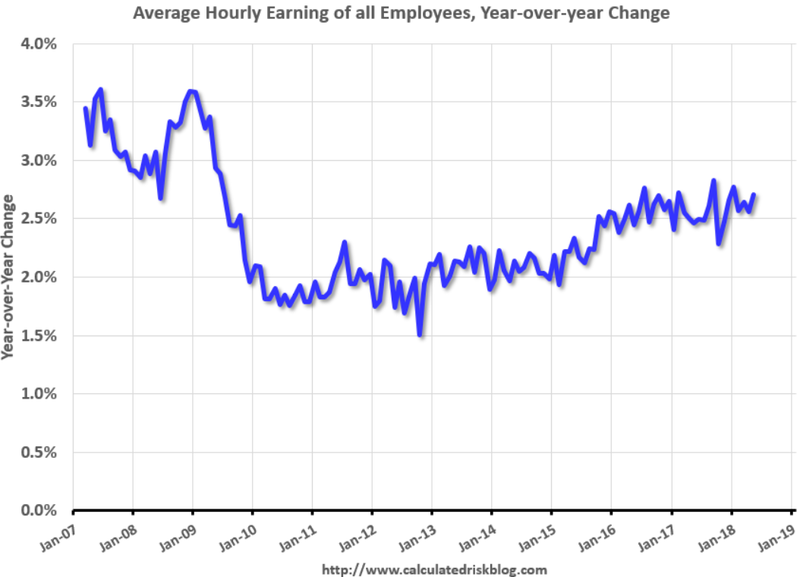 The latest wage growth numbers were neither too hot nor too cold (as you can see below). Average earnings were up 2.7% year-on-year in May, from 2.6% in April. Month-on-month, wages rose 0.3%, versus a forecast for 0.2% growth. More rapid wage growth would almost certainly cause the Fed to accelerate their tightening schedule. But today’s numbers imply another quarter point hike on June 13th followed by another quarter point hike on September 26th – the scenario envisioned at the beginning of the year. About the only major change in expectations centers around December. 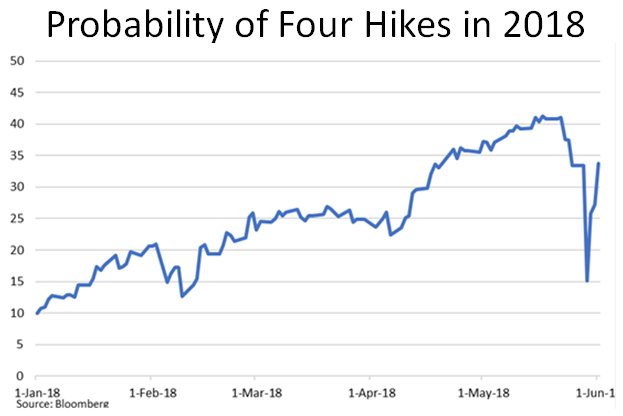 Prior to today’s report the odds of four rate hikes in 2018 (meaning a hike in June, September, and December) stood at 25%. After the jobs report they were about 1 in 3. Not a sure thing by any stretch, but two or three more decent job reports combined with robust wage growth numbers will push this well over 50%. That is unless something blows up in the global economy. And if you are looking for fireworks, you can always rely on Europe to provide the spark. European politics was back in the news this week. Mariano Rajoy lost a vote of no-confidence on Friday and was replaced with Pedro Sanchez, Spain’s socialist leader. While headline grabbing, the bigger news was to be found in Italy. Earlier this week the markets rioted as they feared any new election would turn into a referendum on euro membership. 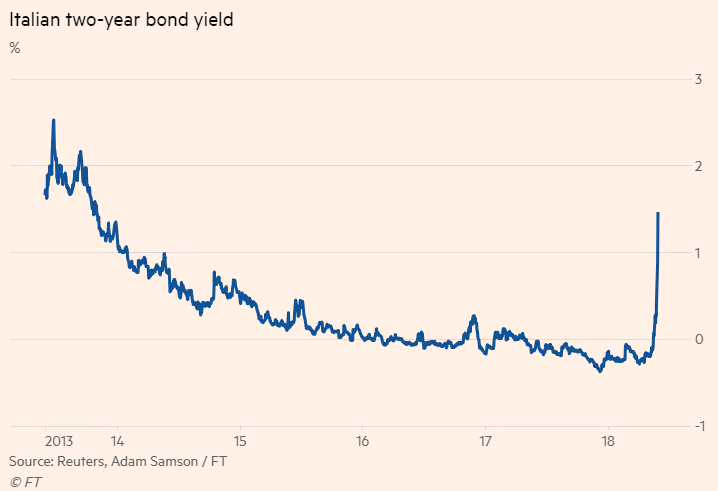 Italian bond yields shot higher (as you can see below) as investors priced in political turmoil. Echoes of Brexit were in the air. However, by Friday worries were abating after a new coalition government looked like it might take shape (might being the operative word – by Monday everything may have changed). As a result, the Italian equity market completed a round trip. As you can see below, Italian equities were hammered earlier in the week, but bounced handily on Friday. This shouldn’t obscure the fact that Italy is a mess, both politically and economically. And unlike Greece or Portugal, Italy is big enough to matter. 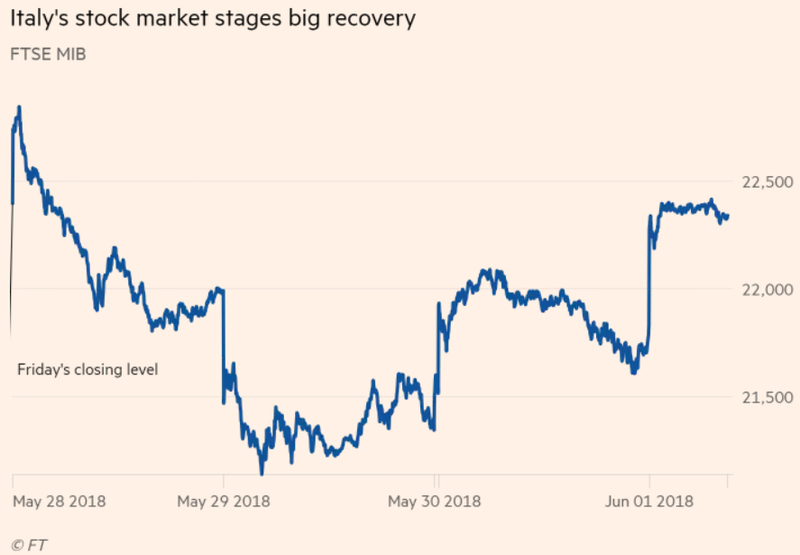 After all, there is 2.3 trillion euros of Italian debt in the market and it accounts for roughly a quarter of Europe’s entire sovereign bond market. If Italy bails on the euro then the common currency will almost surely disintegrate. And under that scenario there will be few winners, which means, at least for the time being, that interests are aligned in keeping the euro together. But Italian discontent is not going away easily. Much as President Trump tapped into long simmering grievances in 2016, the current Italian coalition of M5S and Lega are exploiting the sense that Italy is falling behind the rest of Europe. 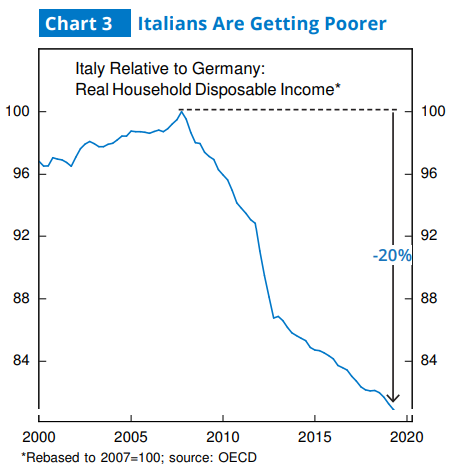 Since roughly 2006 Italian incomes have fallen 20% relative to Germany’s, as you can see below. There is no easy solution for this. Speaking of no easy solutions, trade policy was back on the agenda in Washington this week. This on-again, off-again issue is back in the news after the U.S. slapped tariffs on three of its biggest trading partners by deciding to begin levying tariffs on imports of steel and aluminium from the EU, Canada and Mexico. This comes after the admistration said it is moving ahead with 25% tariffs on $50bn of Chinese imports combined with limits on Chinese investment in U.S. technology. You’d be forgiven for thinking these issues had gone away, particularly regarding Europe. The administration first announced the tariffs back in early March, portraying them as an aggressive effort to fight the perfidious (now that’s a ten dollar word) behavior of China and other countries to subsidize their domestic metals industries, undermining American national security. Then, soon after they were announced, the administration gave exemptions to most major American allies, including the European Union, Canada and Mexico. It extended them by 30 days at the start of May, though that was a down-to-the-wire moment. With those 30 days now elapsed, the administration has this time gone the other direction and removed the exemptions. It’s now tariffs for everybody! 1) The prospects for a NAFTA agreement in the near-term are fading. 2) Retaliatory tariffs are coming. The E.U. has issued a 10-page list of tariffs on U.S. goods ranging from Harley-Davidson motorcycles to bourbon. Canada and Mexico are drafting up similar lists. Apples from Washington, soybeans from Iowa, and autos from Michigan could all be hit. And of course there is China. What will they do in response? 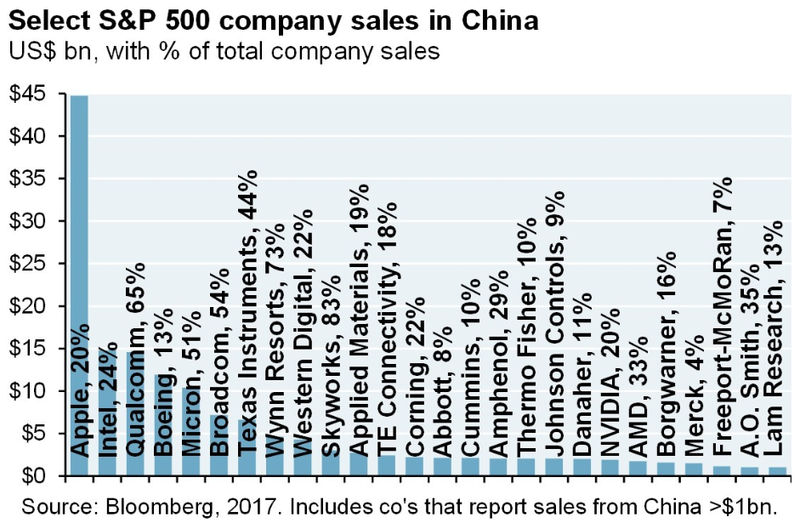 Select U.S. companies do a lot of business in China, as you can see below. In the coming weeks and months, we’ll be posting regular short(er)-form content to our blog (www.gemmerllc.com/blog). Most of the content will consist of pieces we’re reading from around the investing world, or interesting market dynamics we think are worth highlighting. We’ll be linking to each blog post via Twitter – follow us via the handle @gemmerllc, or by clicking here.